Cerebral palsy is a disorder in which the brain is not able to properly control and coordinate movement of the body. CP is usually caused by damage to the brain during childbirth. Cerebral palsy is the most common childhood motor disability in the U.S.
Not every child with CP needs a wheelchair. In fact, almost 60% of all children with cerebral palsy are able to walk independently without any equipment. For those children with cerebral palsy that cannot walk independently, 10% use handheld mobility equipment and 30% require wheelchairs. There are a number of different types of wheelchairs available specifically designed to accommodate the special mobility needs of children with all types of cerebral palsy. Traditional, manual powered wheelchairs are inexpensive and easy to transport. They typically feature 2 small caster wheels in the front with 2 large wheels in back with rims for pushing. Manual wheelchairs can either be rigid or foldable and they offer a variety of customizable features. However, children with cerebral palsy often have limited arm strength or control so they may not be able to move themselves in these types of chairs. This makes traditional wheelchairs less effective as a mobility device for kids with CP. 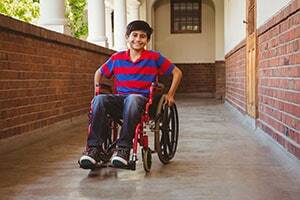 Powered electric wheelchairs have the most to offer for children with cerebral palsy. Electric wheelchairs offer a variety of control options that can give almost any child with cerebral palsy the ability to move around independently. Most electric wheelchairs for CP feature a joystick type of control that enables the user to move the chair in any direction simply by moving the control stick. For users who are not able to use a joystick control, more advanced operating systems are available including touchpad controls and even eye gaze controls. Electric powered wheelchairs can be equipped with a host of additional features and operative enhancements that can be particularly beneficial to children with cerebral palsy. Many of these features are discussed below. One of the most common wheelchair enhancement features for cerebral palsy users is power tilt or tilt-in-space. Tilt-in-space chairs have special seats that can pivot 30-60 degrees upward with the push of a button (or manually) while keeping the hips and knees at 90-degree angles. In other words, the user remains in the fixed seated position with knees bent while the entire chair pivots backward. Tilting offers a number of general benefits. It shifts body weight to relieve pressure from certain areas of the body such as the lower back which is very important for users who spend all day in their wheelchairs. It also helps improve circulation. Tilt-in-space chairs provide mobility benefits that are particularly useful for children with cerebral palsy. With a tilt chair, a child with CP can be moved into a postural position that makes them more functional in performing certain tasks. Children with CP are often unable to control spastic muscle responses which are frequently triggered by moving the legs out of a seated position. The tilt-in-space avoids this by pivoting the user with the legs in the fixed seating position. Various studies have shown that tilt-in-space chairs are very beneficial for children with cerebral palsy. The main drawbacks of tilt-in-space chairs are that they are large and very heavy which can make them difficult to transport and maneuver. They also seat the user much higher than other types of chairs making it harder to fit under tables. Reclining wheelchairs unable users to open the seat-to-back angle and elevate the legs. The movement is just like of a typical reclining easy chair. The reclining feature offers many of the same benefits as tilt-in-space including relief of pressure, comfort, and improved circulation. They can also move the user in more functional positions but not with the same effectiveness as a tilt-in-space chair. One significant problem with reclining chairs, however, is sheering and sliding. When the user reclines back, gravity causes the body to slide downward. This can be very problematic for kids with CP who have problems with spastic muscle control. Some children with CP might be able to use standing wheelchairs. These type of electric powered chairs look a lot like a Segway or scooter. They support the user in an upright position with back and head stability. Movement is usually controlled with a joystick on the armrest. What education opportunities do children with cerebral palsy have? What is diplegic cerebral palsy? Children with CP sometimes have torticollis or they are frequently arching their back.